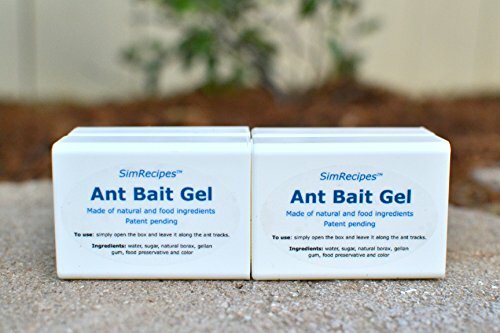 Leveraging patent-pending technology, SimRecipes' Ant Bait Gel provides a green solution to the ant problem in and around the house. It uses only natural and food-grade ingredients to lure the worker ants to take the sweet baits back to the nest to feed and kill the queens. It can effectively manage the ant problem without any environmental impact and leave no harmful chemicals to your home and garden. Compared to the liquid products, the gel formulation ensured minimized water evaporation and greater effectiveness. Patent-pending green technology: Use only natural and food-grade ingredients. No hidden "other ingredients". Contains only water, sugar, natural borax, gellan gum, food grade preservative and color. That's all! Intentionally blue colored, to repel children and pets. If you have any questions about this product by SimRecipes, contact us by completing and submitting the form below. If you are looking for a specif part number, please include it with your message.